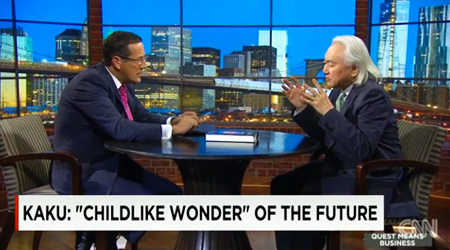 When Richard Quest, host of CNN’s ‘Quest Means Business’ invited Dr. Michio Kaku to appear on his show to share his visions of the future, Dr. Kaku was happy to oblige. Touching on subjects that leap from the pages of his latest New York Times Bestseller, THE FUTURE OF THE MIND, Kaku and Quest explore the spectrum of breakthrough ideas and inventions on the horizon, from augmented reality to augmented physiology. WATCH NOW! and stay tuned for another installment in January 2015. INTERSTELLAR, the inter-dimensional sci-fi blockbuster movie from acclaimed director, Christopher Nolan, continues to wow audiences and critics alike with mind-bending sights and sounds at the forefront of science and storytelling. Recently, the feature editors at VARIETY, the premiere Hollywood publication, respected throughout the world of show business professionals since 1905, asked Dr. Michio Kaku to contribute to their annual CONTENDERS Series in a special feature called CONTENDERS: WRITERS ON WRITERS. 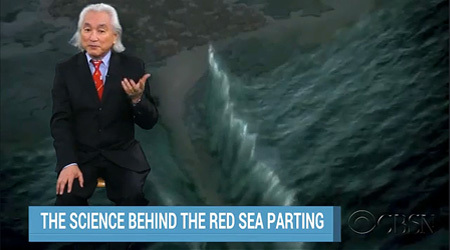 Dr. Kaku shares his insights and impressions, not just as a physicist and futurist, but also as an avid moviegoer and bona fide fanatic of science fiction. The special feature is ONLINE NOW and hits print at newsstands this week. Ready for more outer-worldly adventures? Fly through the wormhole with this recent video post featuring Dr. Kaku on the SCIENCE OF INTERSTELLAR and a detailed paper that delves still deeper into the mighty mysterious realms of interstellar travel. 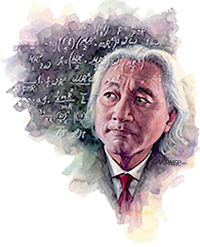 Celebrating the 350th Anniversary of the founding of New Jersey, world-acclaimed theoretical physicist and best-selling author, Dr. Michio Kaku will speak at Liberty Science Center on Tuesday, December 9th, 2014 at 6:30 PM EST. Dr. Kaku’s special public appearance, speaking on the subject of Innovation, is the second installment in a three-part inaugural lecture series, entitled Presidential Speaker Series, launched by New Jersey City University (NJCU), to explore the NJ350 themes of Liberty, Innovation, and Diversity. "What better way to celebrate New Jersey’s 350th birthday than to invite everyone to join us for three unforgettable evenings that bring to our community luminaries who share their thoughts on liberty, innovation, and diversity? – three building blocks that have defined our state from its earliest days," said Dr. Sue Henderson, NJCU president and host of the series. Founded in 1664, New Jersey‘s rich heritage spans well beyond the establishment of the United States, as one of the nation’s original thirteen colonies. From Thomas Edison to Bruce Springsteen, New Jersey’s innovations and innovators have had an impact throughout the world. For more information about the NJCU Presidential Speakers Series or associated NJ350 events, call 201-200-3196 or visit the NJCU website.